I can’t believe 2007 passed without me cooking anything for my Global Gastronomy project. Bad, Cia! I have at least four pending recipes from acquaintances and friends, but c’est la vie, the year went by just like that. Over the weekend, it was colder in New York City than it was in Budapest, Hungary, and their city experiences what they call a Russian front. Canadian front? Meh! It gets cold over there. I work with a few talented boys based in Budapest. We talk every morning over IM. If work doesn’t get in the way, I get a spatter of Hungarian words in exchange for some quirky American slang. They know about this blog and we are each other’s contact on Flickr, so when I asked one of them, Keki, to send me a family recipe, there were no questions asked. He said he had to use the dictionary a lot to translate his mother-in-law’s handwritten recipe, so I was very grateful when I received two: a vadas sauce to go with beef and the dumplings to complete the meal. 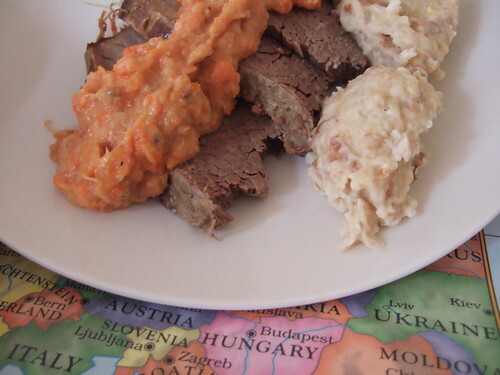 Vadas comes from vad, which means “game”, and Hungarians make the base of the sauce using all kinds of gamey meat. I used beef to make it less difficult. My arms got tired when I tried this at home and I understood why Hungarians don’t make it often. You need at least a day to marinate the beef and a couple of hours to get the sauce and the dumplings done. Keki said that his mother-in-law makes a wicked version, and because they’re not readily available in restaurants, he looks forward to eating it. Even the kids love it, especially before they find out that the sauce has carrots in it. When I let Keki preview the photos I took, he gave me the biggest compliment: he said he “felt the smell of vadas” even though mine looked more orange because of the extra carrots I put and seemed a little thicker than what he was used to. I could have used a full cup of sour cream to make it less orange–apparently, a lot of sour cream is very Hungarian. I thought I did better with the dumplings because I’ve had the Czech version, knedlicky, when I visited Prague. If your vadas sauce is creamier, you can sop the dumplings while you eat the beef. When I finally sat down to eat, a wish to visit Budapest sooner than later floated in my head. Thanks, Keki. 1. In a nonreactive pot, render some bacon fat. Add the beef and brown on all sides. Move the beef to the side while you sautÃ© the onions. Add the carrots and the parsnip and cook for about 5 minutes. Don’t forget to turn the beef to avoid burning. Add enough water to cover and toss in the bay leaves and some pepper. Cook in low fire for about 3 hours, covered. After 3 hours, let it cool and store in the fridge for up to 24 hours, turning the beef occasionally. 2. When ready to cook, remove the meat from the water and set aside. Save some of the water. Using a slotted spoon, remove the vegetables and transfer to a large bowl. Mash. 3. Make the dumplings. In a large mixing bowl, soak the toasted baguette in milk. Set aside. 4. Make the roux, or the sauce thickener. In a large skillet, heat vegetable oil in medium heat until somewhat smoking. Pour flour and mix with a whisk. Keep mixing for about 15 minutes or until flour is red-orange. If black spots start to appear in the flour, it means you’ve burnt it. You have to start over. Remove from heat and keep mixing with the whisk to help cool down the roux. When cool, add to the mashed vegetables. 5. Make caramelized sugar. Heat another skillet and cook the sugar with a whisk until it caramelizes. Remove from heat and set aside. 6. Now you have a a large bowl of mashed vegetables with roux. This is your vadas base. Use the leftover water to keep a sauce consistency. Add the sour cream and mix. Add the caramelized sugar. Season with the lemon juice and the mustard until you get a somewhat sweet and sour taste. Set aside. 7. Don’t forget the dumplings. By this time, the baguette has absorbed all the milk. Add in the eggs, flour, butter and salt. Mix until you get a soft and sticky batter. 8. Boil some water in a large pot. When boiling, spoon some batter and make a few balls. Drop them in the boiling water and cook for about 5 minutes, or until they come up to the surface. Avoid overcrowding. Using a slotted spoon, remove them to a chopping board. Slice in thick rounds when cool enough to handle. 9. To serve, slice the beef in thick slices. Arrange the beef on a plate with some dumplings. Pour in some sauce on the side. I am Hungarian too, and this is almost exactly how we make it at home too. Normally it is made out of the top round of beef. You can give it a richer, deeper flavor by marinading it in good quality red wine (a whole bottle). We normally don’t bother making the thickener, we just put the flour in about a cup of sour cream, and add it to the puréed veggies. I also add flat leaf parsley and bacon to my dumplings to give them an even better taste. I’m also Hungarian, but this recipe isn’t the same as we do it. We use more sour cream, less carrot, no bacon at all, etc. Vadas should be more creamier than this. Dumplings isn’t made of baguettes, they are simply flour, little water (or milk) and egg things.